From R. K. Laxman’s ‘Common Man’ in the ‘50s and Pran’s Chacha Chaudhary in the ‘70s to Anant Pai’s Tinkle and Sharad Devrajan’s Spider Man India, cartoons and comics have always been a reflective report card of print media in India. But even before today’s ever-discouraging PlayStation age was born—as all other indigenous domestic industries bear the brunt of globalisation—Indian comics had started to slip into dark corners in the light of the widespread adoption of their DC and Marvel counterparts. 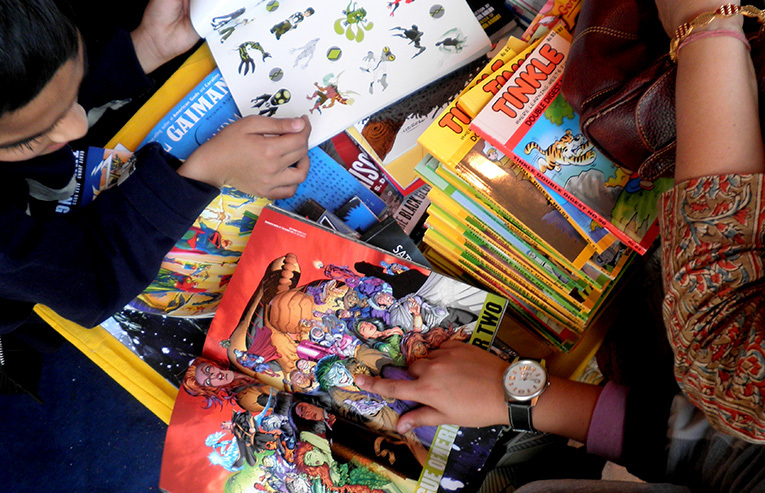 The event was an attraction for all ages and a one-stop shop for any comic-fiction enthusiast. Photograph by Shibaji Roychoudhury. However, a little less than two months ago, Dilli Haat hosted the commencement of what promises to be an oxygen tank for a dying cartooning industry in India: The First Annual Indian Comic Convention, simply monikered as the Comic Con. The Indian Comic Con was billed in as the International Comic Con’s homegrown cousin and was organized by Twenty Onwards Media, who are better known for producing the Golden Kela Awards, which happen to be an Indianisation of the Razzies. Featuring exhibits from major Indian artists and printing houses, along with distributional stalls catering to International publishing and merchandise needs, the event was an attraction for all ages and a one-stop shop for any comic-fiction enthusiast. Be it Herge’s Tintin or Stan Lee’s ‘Marvel’-lous conceptualizations, global toon icons, along with a hoard of characters from Indian mythology and popular fiction, were visibly brought to life on paper, intertwining the world comic fraternity under one roof. To add on as a cherry on the cake of such vast librarian collections of graphic publishing on offer, several competitions, including a Comic Costume Contest, were arranged by the event managers to add vibrancy to the convention and draw in the masses. Apart from the bulky prices of most of the merchandise—which made them virtually unaffordable for the average kid—the First Annual Indian Comic Con, all-in-all, can easily be rated as a success, considering that it sufficed as a commendable exhibit of talent and a fair of international stature for comic lovers. View our extensive Comic Con 2011 photo gallery at this location. Shibaji Roychoudhury was named after someone who wanted to conquer and inspire. Unfortunately, he is far too ambitious for that. A writer, actor, footballer, and dreamer, he wants to achieve the absolutely unachievable. He is the monk still in pursuit of a Ferrari. By Sneha A · Here's to that austere, painful, joyous, and completely insane adventure called love. By ANJA · What must have begun as golden pinpricks had turned into monstrous orange tongues, cutting down giant trees like they were brittle winter twigs.